Quiet Village setting 3 km from historical Sommiers, 35mins from Mediterranean Beaches and the beautiful Camargue. Close to Nimes and Montpellier airports. Sleeps 5 persons, two double bedrooms, 1 with single day bed. Kitchen, dining, patio eating, lounge with sofa bed, TV, wi-Fi ,AC. Private and secure walled garden with private pool. All bathroom and pool towels provided. Good quality bed linen provided too. A cleaning service for the pool is included on a weekly basis . This is a very peaceful setting in a most beautiful part of France. There is plenty to do. Your holiday can be as restful or active as you choose. The local town of Sommieres has plenty of interesting little shops and restaurants, something to suit everyone. The Saturday market is a must, the 'brocante' market is full of little keepsakes that you have always wanted. The area is steeped in history,beautiful landscapes,friendly locals and don't forget the wine. So much choice ! This is an old house with a modern twist. The kitchen and bathroom are fully equipped and modern. The furnishings are comfortable and welcoming. The WC is separate from the bathroom. The garden is walled and private,giving a sense of peace and relaxation. The W.C. Is separate from the bathroom.it includes a bath, a large shower,wash basin and cupboards. Good quality bed linen and towels are provided. Pool towels included. The owner loves to cook, so you will find everything you could need and more. The dining table easily seats six people. A good selection of serving dishes and table ware is provided. There is a good sized terrace with outside dining table and chairs. There is another smaller terrace poolside. Exclusively for the guests, not shared. swimming pool is private and for the sole use of the renters. Très jolie maison offrant des prestations au top, literies très confortable linge de toilette et de lit en quantité, vaisselles équipements , tout est réuni pour passer de très bonnes vacances. A proximité de nombreux villages et villes . 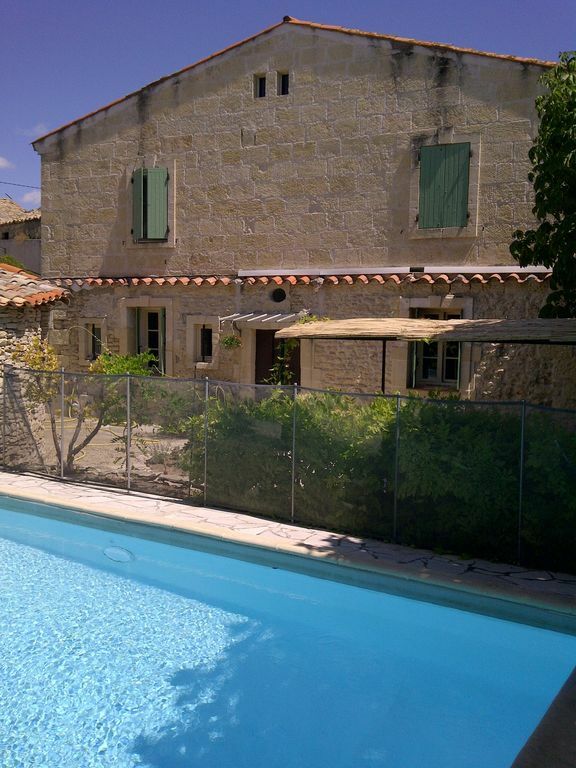 The house in the small town of Aujargues is a well maintained, period property with a walled garden providing complete privacy. The principal interior rooms are spacious and 2nd level bedrooms have a nice mix of modern and antique furniture. Front of house windows open onto the stone terrace and overlook the large private pool. In late September when we visited, it was warm enough to have a relaxed late breakfast on the terrace. When we arrived, we were met by the property manager at the train station. She was a tremendous help after a long flight and train ride, getting us to the car rental facilities and oriented with local restaurants + grocery stores. Magnificent historical site seeing close by vehicle makes the house perfectly situated for day trips. Barcelona is less than 3 hrs away. There was so much to do (eating delicious food and drinking wine) and see (Nimes, Montpellier, Pont du Gard, Camargue region) that one week wasn't nearly enough time. Maison agréable dans un petit village très calme. Petit bémols la maison est situé juste à côté d'une église qui sonne toutes les 1/2 heures, mais on s'y fait. A seulement 19 kilomètres de Nîmes et à 5 minutes en voiture de Sommières qui est une jolie petite ville animée. Je n'hésiterai pas à relouer cette maison. Magnifique petit village tout près de Nîmes. Très jolie maison ancienne, avec tout le nécessaire pour passer un bonne séjour.